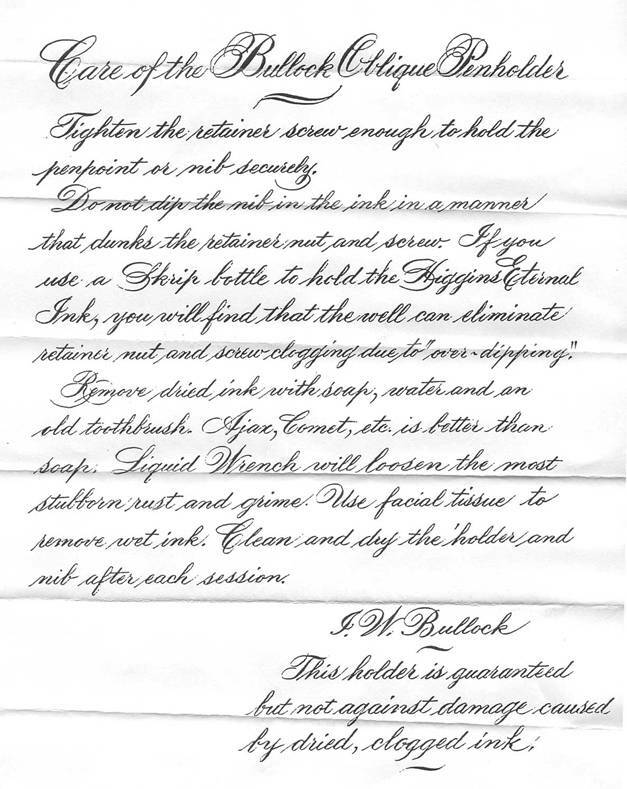 *See bottom of page for IW Bullock’s Penholders. Born on Christmas Day, 1915, IW Bullock is a native of Creedmoor, North Carolina. After graduating with Phi Beta Kappa honors from Duke University in 1937, he went to work for famous strongman Bob Hoffman, and his strongman team that traveled around the country, putting on weightlifting demonstrations and promoting York brand barbells. Naturally athletic as a youth, "I. W." set a weightlifting record in 1933 when he "cleaned and jerked" 308 pounds. From 1940 to 1950, IW earned his living as a beer salesman, first for the Krueger Company and later for the Rupert Brewery. 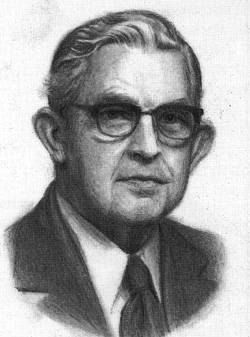 During these years he became a portrait artist, and was known for his realistic renderings. In 1950 his interests turned to the field of photography, and he opened a photographic studio in the Norfolk-Durham area of Gravel County, North Carolina. Entirely self-taught, IW became proficient in various photographic disciplines, especially that of photo retouching. Through this skill he learned hand control, a valuable asset years later when he practiced calligraphy. In 1954, IW Bullock secured employment in the County tax off ice that was located next to his photography shop. He became a tax collector, then a tax supervisor and auditor, serving his county in these positions for 25 years until his retirement in 1979. Upon his retirement, Mr. Bullock became interested in calligraphy He began teaching himself the art by studying the Speedball textbook. Old English and Copperplate held a particular fascination for him. He wrote to the Zaner Bloser Company for further information and purchased a number of their oblique penholders. As time went by, IW worked to improve the design of these unique penholders. He succeeded in developing oblique penholders that were more versatile than any on the market, as his could hold pen points of all sizes, including crow quill points. 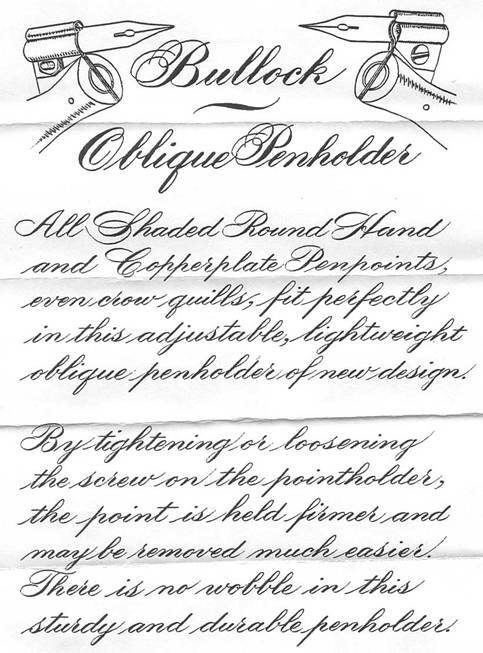 In the past ten years, Mr. Bullock's heavily shaded lettering and "ob-holders" (as he calls them) are known to calligraphers throughout America. 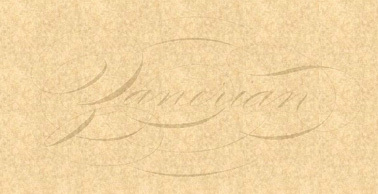 He has taught numerous classes in Copperplate lettering, and continues to devote much of his time to this form of calligraphy. Top and bottom views of the unique metal flange on the Bullock holder that can accept a wide variety of nibs. You should note the custom ground screw and nut locking mechanism.